This year's Kentucky Derby was certainly exciting for its mint-julep-soaked spectators. But our future-minded ancestors might have considered it a bit old fashioned. Why? None of the jockeys were robots. The March 1945 issue of Radio-Craft magazine imagined a future where human jockeys would all be replaced by radio-operated robots. 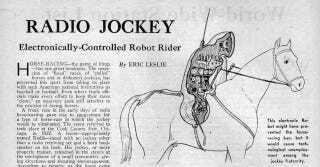 The jockey-bots would be outfitted with cutting-edge radio controls and loudspeakers, while their human controllers would sit near the track in front of electronic panels and microphones. The "jockey" would consist of a modern radio receiver, with outputs fitted both to a speaker and to relays which would set into action motors which control the arms to which the reins are attached, or operate the crop. Additional motors can be provided—or attachments made to those used—which would permit changing the posture of the "jockey," causing it to lean further forward or rise upright, to sway to the left or the right, as may be required during the race. It is well-known that a jockey uses his body as well as his voice and the reins in guiding his horse. The illustration below showed what a race of the future might look like. The idea may seem absurd to traditionalists, but there are plenty of people here in the 21st century who think the sport should completely do away with human jockeys. "We're talking about drone planes in Afghanistan," jockey C.C. Lopez told the Wall Street Journal in 2012. "Is it really that big a stretch to have someone at the race controlling a robot from the stands with a joystick? It isn't far-fetched at all." It's certainly possible to replace human jockeys with robots, and Dubai is already embracing it for camel races. But given horse-racing's love for tradition, we probably won't be watching ASIMO win the Triple Crown anytime soon.